In recent years the significant progress in satellite-based observations of plasma states and associated electromagnetic phenomena in space has resulted in the accumulation of much evidence of various plasma instabilities. Today plasma instabilities are believed to be responsible for electromagnetic radiation as well as for many of the macroscopic dynamics of plasmas in space. Most students who begin to study plasma physics are intrigued by the unstable nature of plasmas compared with other states of matter; however, they often become frustrated because there are so many in- stabilities. Such frustration explains in part why there is no textbook which treats this subject exclusively. A description of plasma instabilities in a systematic way is nontrivial and takes a pertinacious effort. This book is an attempt to provide a basic introduction on the subject and covers most of the important instabilities. However, the author must apologize for any omission of references to contributions of individuals who deserve more credit. The reader is assumed to have a general knowledge of plasma physics obtainable in an undergraduate course. 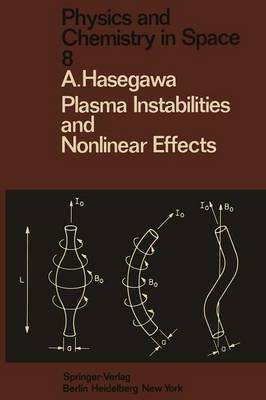 The book is intended to be used as a reference text on the subject of plasma instabilities at the under- graduate level as well as for a text in a special course in graduate school. Because the book is part of a series on physics and chemistry in space, emphasis is placed on plasma instabilities relevant in space plasmas.